Frosch is the legendary Bakguan bringing sage wisdom into play. It is the wisest and the most tactical of The Six Legendary Bakugan. It is a gigantic frog-like creature with huge legs for fast maneuverability and a long whipping tongue. 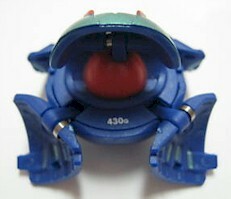 In battle, Frosch produces a water tornado to overcome its enemies. It is medium powered and has an open mouth in the front. It doesn't have many powerful cards but it is still good in battle. Purchase Frosch from Amazon now!